! 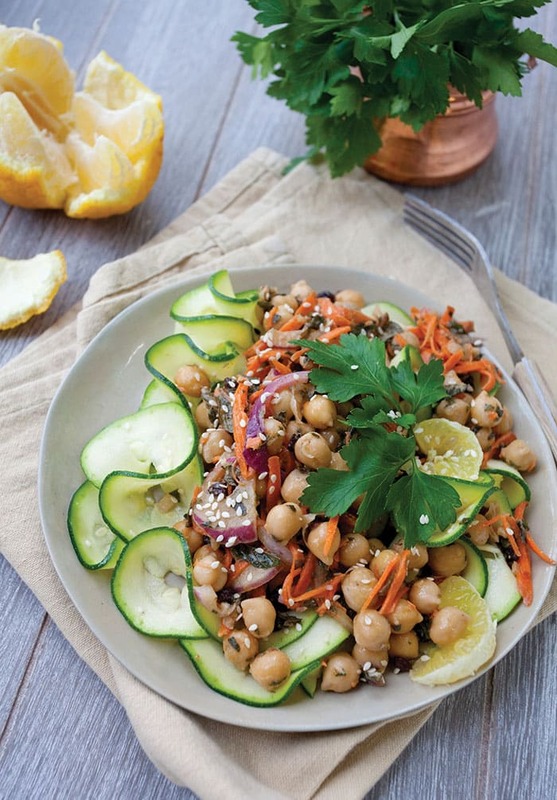 The recipe I’m sharing today for the Zucchini Noodle Salad with Moroccan Chickpeas is an amazing addition to your summer meal rotation and makes a darn good lunch too. Be sure to check out Chris’ blog, Tales of a Kitchen for more great recipes. I’ll be sharing at least one more recipe from the book this summer. The book has recipes for every meal including chapters for breakfast, apps, soups, raw entrees, cooked entrees and desserts. 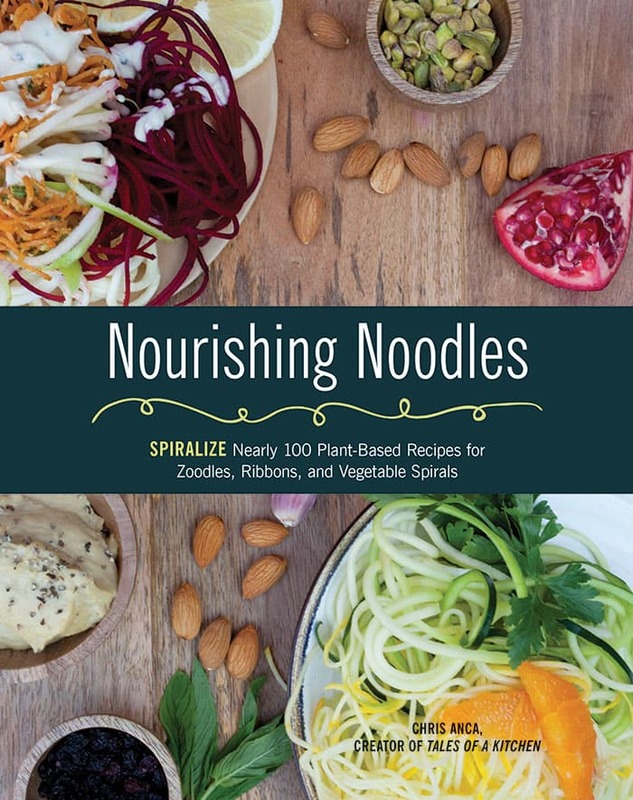 If you already have a spiralizer or are thinking of getting one, this book is for you! Place all noodle ingredients in a medium bowl and gently massage for 30 seconds. Set aside. To make the Moroccan chickpeas, place the red onion in a medium bowl with the apple cider vinegar and the coconut nectar, and mix well. Set aside for 2 minutes. Add the chickpeas, carrot, mint, and currants to the onion, and combine. Add the dressing to the chickpea mixture and toss until thoroughly coated. 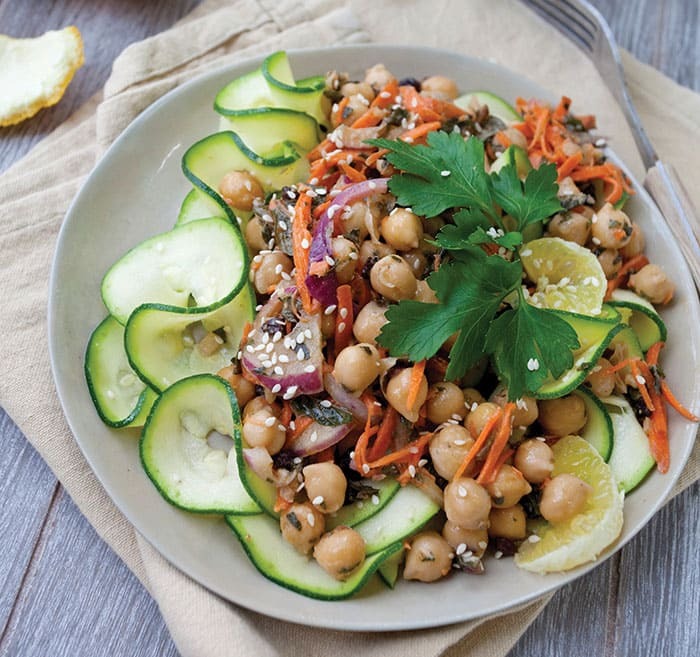 Divide and arrange zucchini noodles on serving plates, spoon the chickpeas on top, add toppings, and serve. « Vegan Strawberry Shortcake Recipe with Aquafaba!